Is the news release still relevant? It remains by far the most common tool and tactic for gaining attention. The ultimate success or failure of a release depends on factors that are many and varied. There’s time of day, day of the week, customisation. Not to mention email distribution lists and a number of other factors that PR pros should consider before sending out a news release. With that in mind, pr.co asked the question, “What can we learn from 50,000 press releases?”. We took a look at the news releases it has published over the last few years and found some statistics that will be helpful — all gathered in this infographic form. The study was first published on PR Daily. 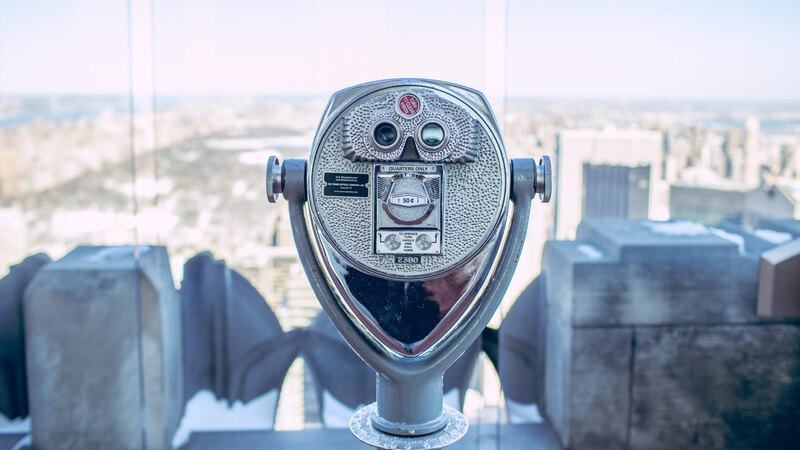 We gathered data from all the presslist campaigns sent through pr.co, since the feature was released in March 2013.We’re looking for open and click rates. We want to understand if there is a correlation between the amount of emails you send and the rate of people interacting with it. Why we care about the amount of emails? You already know writing news about your company is not enough. You need to spread the word reaching out to the right people, at the right time, in the right way. So, how do you reach out to your audiences? How many people do you usually email? How personal are your emails? 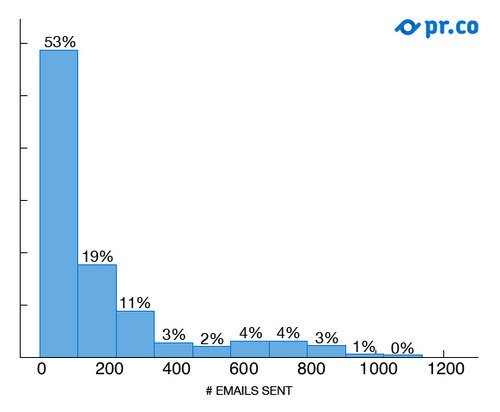 Here is a breakdown showing how many emails are sent per campaign. More than half (53%) of all the campaigns sent through pr.co have less than 100 recipients. To be more precise, 21% of all the campaigns has between 2 and 19 recipients. Another 20% has from 20 to 60 recipients. Campaigns with more than 200 emails sent are way less recurring. Among the ‘big’ campaigns, many have between 600 and 800 recipients. On the other hand, only 17% of all the campaigns has more than 300 sent emails. How do you measure your email campaigns? What metrics are you looking at? The most obvious ones are open and click rates. How many of your recipients clicked on the link in your email? If they don’t click, they won’t accomplish your call to action - and if they don’t open, they won’t click. So opening and clicking are required steps. 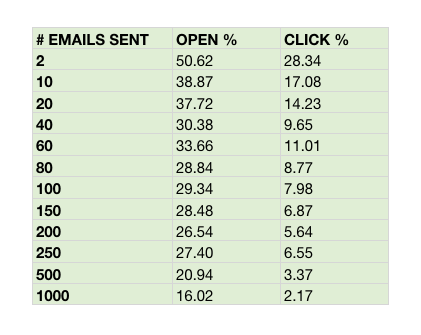 Let’s check then how open and click rates change and if there is a correlation with the amount of emails sent per campaign. When a campaign is sent to 2-9 people, the average open rate is 51% and the click rate is 28%. Up to 80 emails sent, the open rate is above 30% and the click rate is around 10%. As the amount of emails grows, we can notice a drop in the open and click rates. 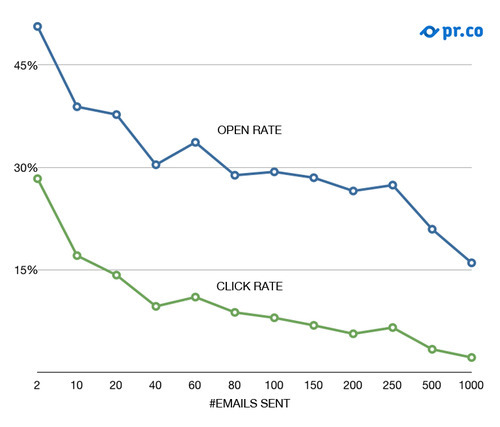 According to this data, a negative correlation exists between the amount of emails sent and the open and click rates. We also saw some very successful campaigns, where open rates were above 30% even with hundreds of emails sent. On the other hand, some campaigns had no clicks - regardless of the amount of emails sent. I would argue that it’s increasingly difficult to maintain bigger lists of emails, as many things can change and it’s hard to keep everything up-to-date when numbers grow. We run a simple database query to extract the presslist campaigns since the release of the feature. The amount of emails sent per campaign is the first information we need. In a single campaign, the emails sent may either be the same for all recipients, or everyone could get a personalized email - or something in between the two options. The more the recipients, the less likely customization is. We removed right away 5% of campaigns at the top and at the bottom, for a couple of reasons. First off, campaigns with only one recipient are usually tests. Moreover, we also noticed a few campaigns with a huge amount of emails sent - between 1200 and 12000. The amount of emails here is so different from the majority of the campaigns that we didn’t want the results to be twisted because of those. Let us know your thoughts @prdotco!